Tasty, but the sesame-coated avocado was a faff & we weren’t especially excited by the flavour when it was grilled, given the effort expended in trying to prevent it turning to mush in the pan. Will try again without the grilled avocado. A rare ‘meh’ for a Hetty recipe. Even the ample lemon juice failed to brighten this from being stodge. Dreaming up flavorful yet nutritious meals, night after night, is one of the greatest challenges in home cooking. The secret to success is developing a repertoire of family classics--simple, adaptable, and nourishing recipes that you will want to cook time and time again. 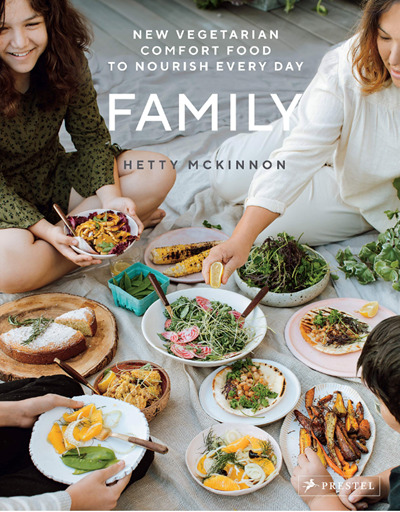 In Family, Hetty McKinnon shares her approach to modern, hearty, and healthy comfort food that is powered by vegetables. Some of these recipes are heirlooms, passed on from her mother, others are old family favorites, and many are healthier variations on much-loved food. With everything from a deconstructed falafel salad of roasted chickpeas and fresh greens to an earthy miso brown butter pasta with sage to sticky banana golden syrup dumplings, this book provides fun, uncomplicated food for everyone. Interwoven with McKinnon's recipes are family stories from home cooks around the world. Family teaches home cooks how to build a repertoire of crowd pleasing, flavorful vegetarian meals and shows families how to successfully eat healthily together.